I love reading and learning more about WWII. I have read a lot of nonfiction WWII books and have read quite a few fiction books based during this time frame as well. I am picky when it comes to historical fiction though. I want to learn about a time and place I know nothing about, but I want it to be as accurate as possible. So I often finish historical fiction books with mixed thoughts. I also am not a huge reader of newly released books. I don’t gravitate towards books that are getting a lot press. If they hold the test of time and are still talked about a few years later, I might pick them up. But I am not a have to have it right after it is published. Especially when it comes to fiction, which is why it took me forever to read this book. This book has been out for ten years, but I was reluctant to read it when it was first released. Once I realized though that there was a Netflix movie coming out, I knew I had to read it since I do try to read the book before I watch the movie. A few weeks ago I finally picked up this book to read. And I loved it!! Loved it. I don’t tend to read books that are letters back and forth, but in this book it worked. I loved the story, the descriptions, and the people. As I read this book, I wanted to know more and could not put it down. I read it in two days. It also left me wanting to know more about this part of the world during WWII. That is always a sign of a good book. If you haven’t read this yet, I highly recommend it! On the historical accuracy part of this book and also keeping it a totally honest review, I have a few thoughts to add. From what I can tell, the majority of it is accurate. However, I think there are a few things in this book that are in the book to make it fit into modern times and don’t really fit the time frame of the book. This is common with fiction books and is one of the reasons I don’t tend to read a lot of historical fiction. Overall though, I loved the book, and I hope Grace reads it soon. 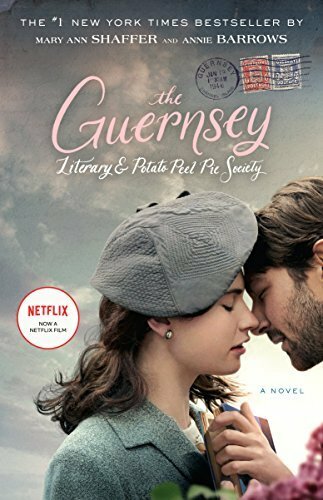 For my thoughts on The Guernsey Literary and Potato Peel Pie Society book vs. movie be sure to read my post all about the The Guernsey Literary and Potato Peel Pie Society book vs movie. I picked this up at a summer fete last month, so it is sitting on my TBR pile – I feel the same way you do about new releases. BTW, my grandfather was in the Channel Islands during WWII, and his passport from the time has some false information in it. We have always wondered if this was because he was on a special mission. Sadly, he never told us anything before his death. That is very interesting about your grandfather. I have read quite a bit on WWII, but know very little about the Channel Islands during the war. I need to find more books on the subject, because I find it all very interesting. I am sure there is so much about the place and those years that we will never know. Have you seen the Netflix movie that the book is based on yet? I read this a few years ago and am planning on reading it again next month since it was voted as our book club pick! And I am holding off on watching the movie until I read it so I can remember the original storyline in case they change some parts in the movie. This is a great book club pick! There is so much to discuss in it. I don’t do a lot of rereading, but this is one book I could definitely read again. I hope that you enjoy the movie when you watch it. Waiting until after you read it again is a great idea.